Just looking at all these pictures makes me miss Palm Springs already! I have not been to Palm Springs in almost 20 years so I was excited to explore and enjoy all the beautiful scenery and weather again. Coming from temps in the 20's with freezing rain and snow, we landed to sunny skies and temperatures in the high 60's/low 70's and immediately felt like we were in heaven. It only rained a bit while we were there, but most of the time the weather seemed almost too good to be true. We decided to stay at The Saguaro which is where all the above pictures were taken. The hotel is super colorful and fun, but just know that it is a very casual environment. Nothing super luxurious - that's for sure. If you want something more extravagant and luxe, I would recommend the Parker, which we visited and ate at later that week. I brought mostly spring/summer type clothing, with a light jacket for the evening when it can get quite cold. I preferred skirts and dresses during the day, so I actually changed out of the above outfit after breakfast and saved it for dinner later that week. With all the gorgeous weather and sunshine, I wanted to enjoy bare legs while I could (no matter how pale they were lol). We packed quite a lot into our time there, and managed to hit almost all the spots that I had hoped to visit. 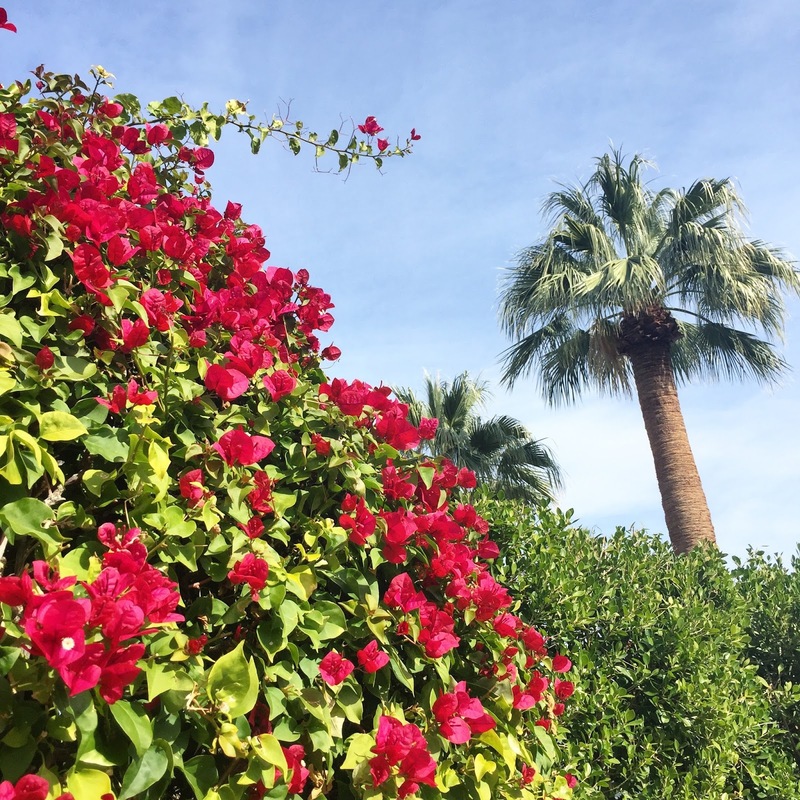 As someone that blogs for a living, I have to tell you that Palm Spring is Instagram heaven! Ha! The colors, the architecture, the landscape - everything is picture perfect. I rounded up where we visited, places we ate and my favorite Instagram spots in the post below. Joshua Tree - It looked magical from pictures, and in person it did not disappoint. Our favorite exhibits were the Cholla Cactus, the White Tank Arch Rock and Skull Rock. Bring a few layers with you, because the weather can change dramatically in a short amount of time. When we arrived, it was in the low 60's and sunny, but by the time we left, it had dropped (in an hour!) to the high 40's with clouds. Eek! Moorten Botanical Garden - This is a botanical garden dedicated mostly to cacti and other desert plants. 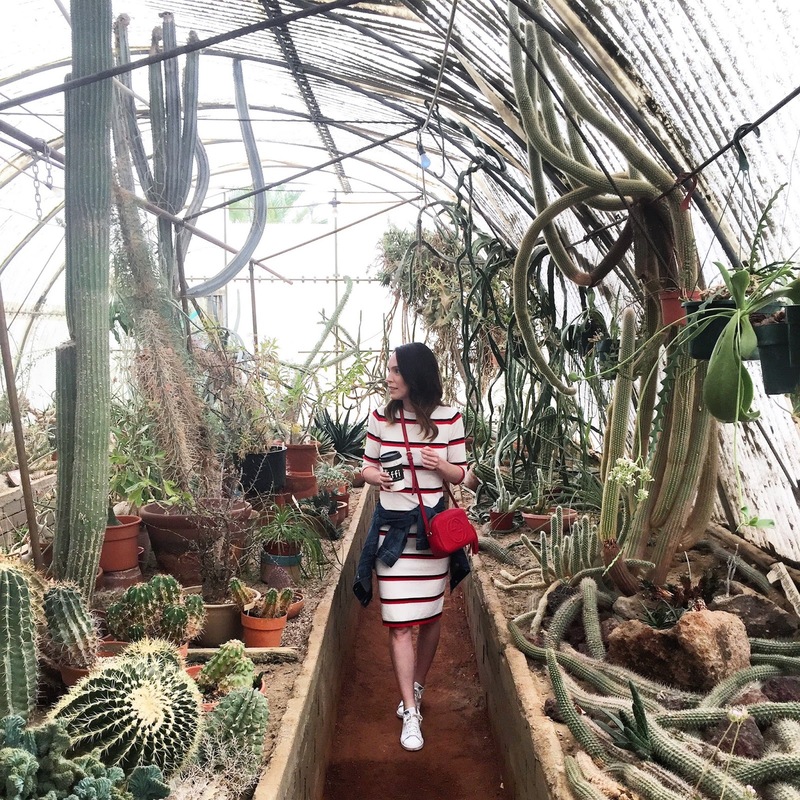 It is only $5 to walk through, and the cactacarium is worth it alone. So unique and fun! Shopping at El Paseo - One of my favorite things about areas that are predominantly warm all year round are the outdoor shopping areas. El Paseo is gorgeous high end shopping district with stores that range from Gucci and Louis Vuitton to J.Crew and Sephora. Cabazon Dinosaurs - "Tell em' Large Marge sent ya." LOL We decided to go here on a whim and it was so hilarious and fun. And since both Stan and I saw Pee Wee's Big Adventure a ton of times growing up, we enjoyed visiting this spot even more. We didn't pay to go in to the main exhibit since we didn't feel it was worth it, but the drive out there is pretty even if for a short time to take pics with the dinosaurs. #thatpinkdoor - The house with the pink door is located in one of the most beautiful residential neighborhoods, so it is worth a trip just to gawk at all the homes. They are magnificent and so representative of the Palm Springs vibe and architecture. Aerial Tramway - This attraction was recommended to us, but we actually didn't do it this time. However, I did ride it many years ago when I was out visiting a friend who lived in Palm Desert. The views are stunning, but the tram ride up is a tad scary if you are afraid of heights. 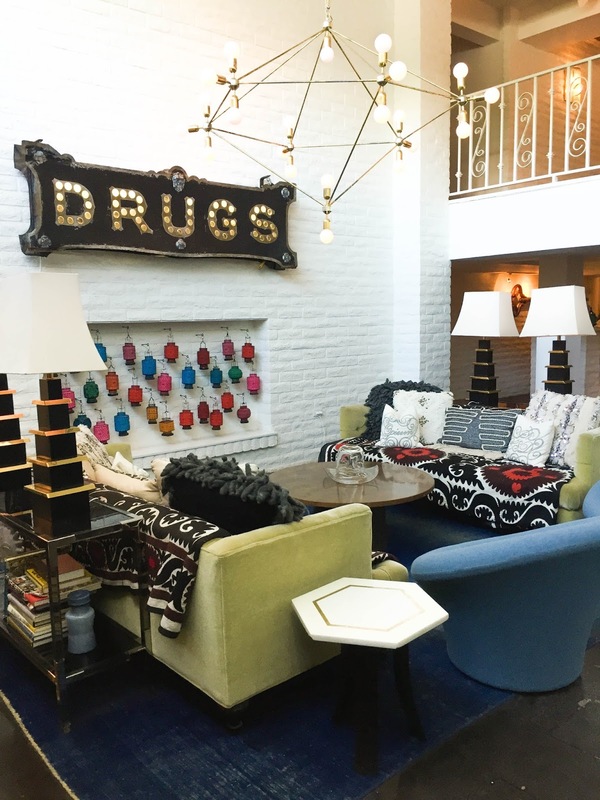 Design District - This was one of our favorite areas in Palm Springs to get coffee and walk around. Head back to the Old Las Palmas neighborhood which is nearby and wander around looking at all the beautiful homes. 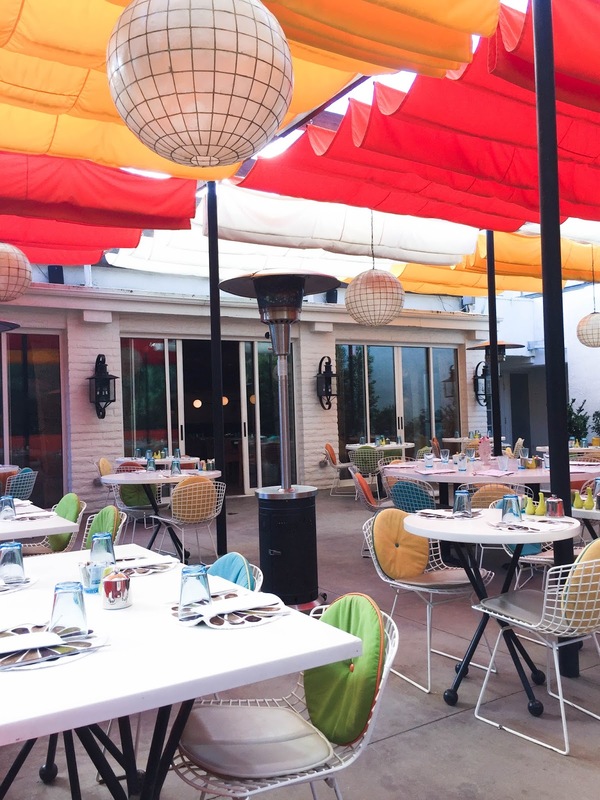 Norma's at the Parker Palm Springs - We had brunch here and while it was good, it's insanely expensive. I would recommend coming here to see the grounds and grabbing a light lunch, but just know that you will probably walk out spending between $75 to $100. Birba - This was our favorite dinner spot during the trip. Almost the entire restaurant is outside with heat lamps which makes the ambiance so cozy and inviting. We ordered a few different pizzas to split. Be sure to get one with a cauliflower crust - it was delicious! El Jeffe - This was the restaurant in The Saguaro and we were quite impressed with the food. And on Tuesdays, they have a "Taco Tuesdays" special which we had where the tacos are only $3! Koffi - I wish I could have packed this place up and brought it home with me! We went for coffee here almost every day and loved it. It's a local chain so there are 3 different locations around Palm Springs to choose from. Ernest Coffee - This was our first coffee place that we went to because they serve Stumptown, but after trying Koffi - we didn't go back. In-n-Out - I am not a huge burger fan, so this was more of Stan's recommendation. It's a California institution however, so you have to go at least once. Stan said to get the Double Double with fries. Reservoir - This was a restaurant at the Arrive Hotel that we had lunch at one day. It's a gorgeous location and you can eat overlooking the pool, but the food was nothing special. 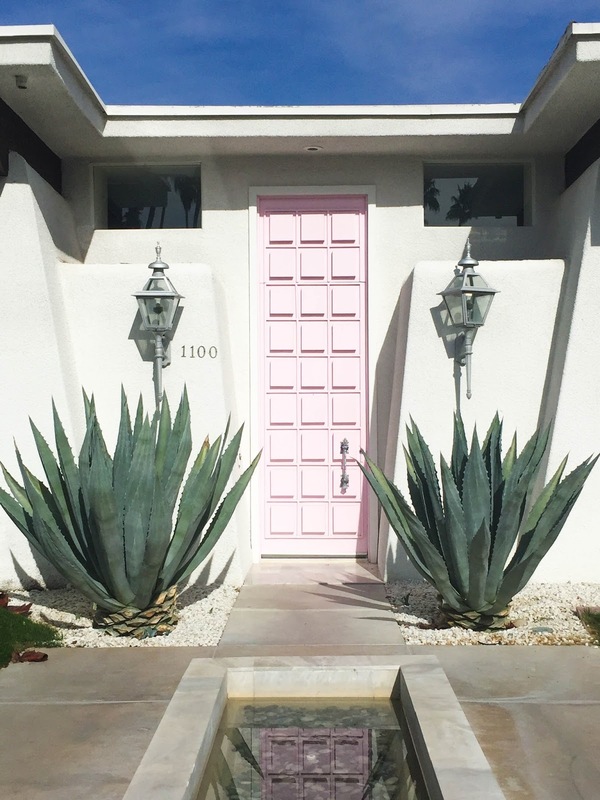 #thatpinkdoor - This home become iconic and really is stunning in person. Or even head down a few houses from this one to the home with the lions in front. Walk around that street and then get in the car and drive through the rest of the neighborhood - the homes are quintessential Palm Springs. The best way to find the house is to just google the address. Yup, it's that easy. Palm Springs sign - The sun was setting when we got here so it was too dark for me to get a great picture of this, but it was on our way back from the Cabazon dinosaurs. It overlooks the mountains and is a great photo opp. Moorten Botanical Garden - Get a pic either in the cactacarium or frankly anywhere on the property - it's so unique and beautiful. Cabazon dinosaurs - It's majorly cheesy, but so iconic. It was insanely windy when were there so I couldn't even attempt a good pic of myself, but I did get a few funny snaps of Stan clowning around with the dinosaurs. Parker Palm Springs - Yup, this place is made for Instagram. However, the server at brunch told us that they will be adding security on the weekends to stop people not staying at the hotel from wandering the grounds. Kind of a bummer but I would go for an early lunch or brunch during the weekday if you can and then look around. The pool at The Saguaro - It's a rainbow of colors and almost every angle is picture worthy. There you have it! 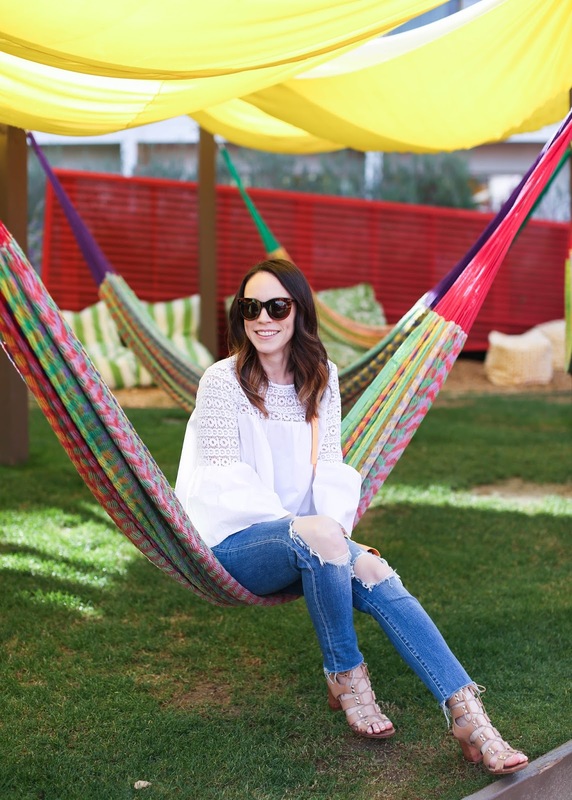 My travel diary for Palm Springs as well as my recommended Instagram spots to visit. Let me know if you have any great ones to add to my list!